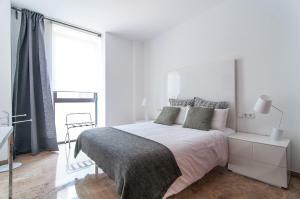 Featuring a shared roof terrace with furniture and city views, Picasso Suites is located in Barcelona’s Eixample District. 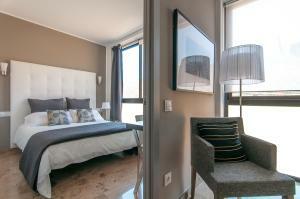 The property offers apartments with free Wi-Fi and air conditioning. 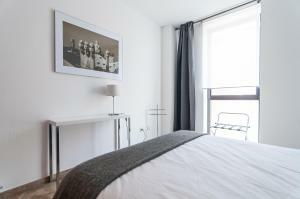 Each apartment has a living room with a sofa, satellite flat-screen TV and DVD player. An oven, microwave and coffee machine are included in the kitchen. The bathroom comes with a hairdryer. La Concepción Market is located next to the apartments. Guests can also find a large variety of supermarkets, bars and restaurants in the area. The property offers various services at an extra cost, including babysitting, car rental, private parking and airport shuttle. Plaça Catalunya and Gaudí’s Sagrada Familia are located within 15 minutes’ walk from the property. Girona Metro Station, with connection to the Gothic District and La Barceloneta Beach, is 300 metres away. 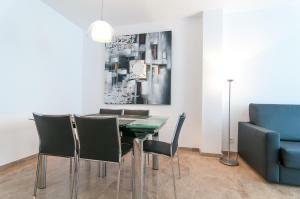 This air-conditioned apartment, has a living room with a sofa, satellite flat-screen TV and DVD player. An oven, microwave and coffee machine are included in the kitchen. The bathroom comes with a hairdryer. Free Wi-Fi is available. Rate: € 121.50 ... € 508.80; select dates below to get current rates. Rate: € 139.74 ... € 441.47; select dates below to get current rates. 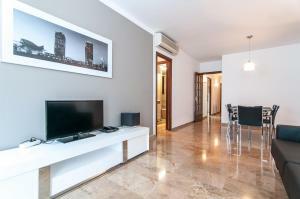 Featuring modern décor, this air-conditioned apartment, has a living room with a sofa, satellite flat-screen TV and DVD player. An oven, microwave and coffee machine are included in the kitchen. The bathroom comes with a hairdryer. Free Wi-Fi is available. Rate: € 138.00 ... € 500.40; select dates below to get current rates.